Bee Happy Garden: What's a Lawn, Anyway? Spring is finally here, and we can't wait to get our hands dirty. Of all the myriad garden chores competing for our attention, the lawn, otherwise known as the patch of cracked clay and weeds, screams the loudest. Even four years after our yard was dug up for new construction, the soil is rock hard, weedy, and unable to sustain much of a lawn. We've gradually worked in lime and compost, but the amount of fertilizer that would be required to get it green is just too damaging, on the environment, on our wallets, and on our time. While I concede to needing an area where kids can run and roll, it seems more prudent to install ground cover and perennial beds that get along with our marriage of clay soil and free county leaf mulch. (Most counties offer free leaf mulch and wood chips. You can pick it up yourself, or hire a truck company to deliver, which is what we did). Yes, we're working with what we have and reducing high-maintenance grass in favor of colorful, all-season bloom and hardy, well-sited plants. In order to get the ground in working order, for no plants other than crab grass and poison ivy can grow unassisted in our existing soil, we are creating berms. Berms are raised beds that are not enclosed by a frame. 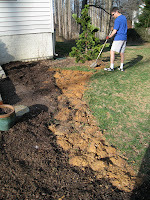 To make the berms, we turn over the sod, spread several sheets of newspaper, pile on leaf mulch, and add some fresh topsoil. It's a start. We let it settle in, and then add a little more compost. We can plant in the berms, which will gradually mix with the clay foundation. Hopefully, they'll be inviting to all those creepy-crawleys that aerate the soil and add nutrients, like earth worms and other micro-organisms. Because they're well-suited to the amount of light and the soil, we won't need to do nearly as much fertilizing and weeding. Maybe we'll even put a nice bench out there and find some time to while away the summer days! I plan to plant edible, sun-loving flowers and herbs around my two raised vegetable beds. In the shadier areas, we'll plant a combination of ground-covers and Native plants, such as Barrenwort (Epimedium), Geranium Macrorrhizum (Big Root Geranium), Japanese Painted Fern, some hostas, and others, t.b.d.